I was so honored to get this award from my favorite blog writer. I love seeing all the yummy recipes at Definitely Leopard and seeing all the leopard items that she finds. My favorite is reading about her kids and how they like the recipes! Create a link to the sight of the person who gave you the award. See above…check! Write 7 random facts about yourself. See below…check!! 1) I am addicted to the internet. I could spend all day looking at stuff and never even move. Sometimes I’ll have my phone, macbook and iPad all going at the same time! 2) I love to walk. I get up at 4:00 almost every morning to make sure I get my walk in. I wish I was a runner, but I’m just really not. 3) I drink a LOT of water. I almost always have water with me. 4) I lived in my house in Dallas for about 39 years. My parents moved out when I graduated from college and I just stayed there. Moving to Austin was a big step for me. 5) I love to travel, it doesn’t even matter where. Wish I could do it more. I really don’t like emptying my suitcase and there is usually a half full one in the middle of the floor. 6) I love my job. Every day I go to work I learn something new. Even on bad days, I feel like I’m the luckiest person in the world. If I won the lottery, I wouldn’t quit my job. I never play the lottery. 7) I love to shop…mostly at Marshalls. I spend a lot of free time going from Marshalls to Marshalls. If there is a Marshalls within a 50 mile radius, I’ll be there at some point!! And finally, create links to some blogs that you think are worth reading …here you go!! Stepping on Crayons – I love the pictures of this beautiful family! The Hill Country Cook – This is a teacher friend that is a great cook and happy homemaker! Spilled Cookies – She is a very insightful writer! Inspired Weightloss – I love reading about weight loss! Living La Vida Local – Eating in Austin is my favorite thing to do! BrandValueShop – I enjoy some of the pictures on this blog! Now it’s your turn! Who do you like to read? 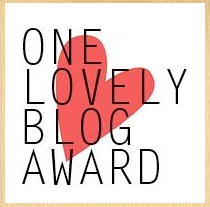 Share your favorites on my comments or give your favorite blog the lovely blog award! I’d love to find some new blogs to read! Hey, i think i might have helped name that blog!